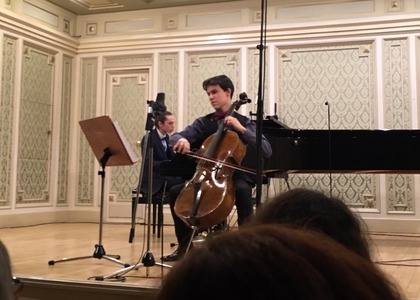 "It is so satisfying to see that two students of the "George Enescu" National College are capable of performing as what you could call a chamber duo at an absolutely remarkable level. I think that out of the latest seasons, this is one of the most important chamber ensembles; it is about setting the standards that much higher. In my opinion, it brings the most satisfaction both to the public and the musicians themselves." "I asked him to play together and he agreed. He chose a piece - Mendelssohn's Sonata No. 2." "This is the piece that brought us together. It is somehow the soul of our ensemble. Chamber room music allows for certain finesse… it's poetry, a concentration of extraordinary music, which can't be found in any other form of musical performance." "For me chamber music represents one of the most important aspects of music because, from my point of view, one of the essential mottos of music is together. And performing together is completely different from playing alone because it requires more attention and it goes much more into detail." "I was pleasantly impressed by these young musicians who had an extraordinarily complex and difficult program to perform, especially without any breaks. I think it is incredible that they did it. And they proved that they have an artistic maturity for their age… I wish them a lot of luck from now on! I'm glad that I was here." "I think the hall was full, I found the program insanely brave for two people who are so young. They confronted two masterpieces and two works that even well-established musicians avoid approaching. Meeting those chamber music titans for this chamber ensemble was - or at least they made the impression that it was - effortless, not at all a challenge beyond their current abilities."